a cave of ice, usually underneath a glacier and formed by meltwater; cave entrances are often enlarged near a glacier terminus by warm winds; most common on stagnant portions of glaciers. 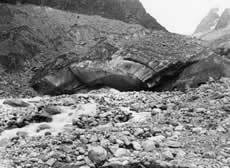 a mass of ice that originates on land, usually having an area larger than one tenth of a square kilometer; many believe that a glacier must show some type of movement; others believe that a glacier can show evidence of past or present movement. 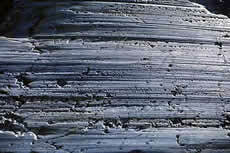 land covered in the past by any form of glacier is said to be glaciated. 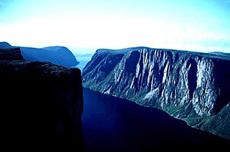 a large u-shaped valley formed from a v-shaped valley by glacial erosion. accumulations of unsorted, unstratified mixtures of clay, silt, sand, gravel, and boulders; the usual composition of a moraine. when the position of a mountain glacier's terminus is farther upvalley than before; occurs when a glacier ablates more material at its terminus than it transports into that region. a boulder swept from its place of origin by glacier advance or retreat and deposited elsewhere as the glacier melted; after glacial melt, the boulder might be stranded in a field or forest where no other rocks of its type or size exist. when a mountain glacier's terminus extends farther downvalley than before; occurs when a glacier flows downvalley faster than the rate of ablation at its terminus.